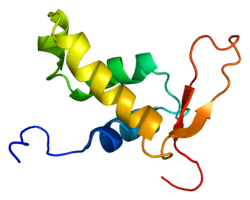 Forkhead box protein O4 is a protein that in humans is encoded by the FOXO4 gene. It is located on the long arm of the X chromosome from base pair 71,096,148 to 71,103,533. FOXO4 is a member of the forkhead family transcription factors O subclass, which is characterized by a winged helix domain used for DNA binding. There are 4 members of the FOXO family, including FOXO1, FOXO3, and FOXO6. Their activity is modified by many post translational activities, such as phosphorylation, ubiquitination, and acetylation. Depending on this modified state, FOXO4 binding affinity for DNA is altered, allowing for FOXO4 to regulate many cellular pathways including oxidative stress signaling, longevity, insulin signaling, cell cycle progression, and apoptosis. Two of the main upstream regulators of FOXO4 activity are phosphoinositide 3- kinase (PI3K) and serine/threonine kinase AKT/PKB. Both PI3K and AKT modify FOXO4 and prevent it from translocating to the nucleus, effectively preventing the transcription of the downstream FOXO targets. FOXO transcription factors have been shown to be the down downstream effector molecules of insulin-like growth factor (IGF) signaling pathway. In the absence of insulin, PI3K is inactive, so the FOXO homolog daf-16 is able to translocate to the nucleus and turn on many genetic pathways associated with longevity in the roundworm Caenorhabditis elegans. FOXO’s activation of these pathways produces an increase in lifespan for worms, flies, mice; similar variants of FOXO3a have been associated with longer human lives as well. Many different kinds of cancers have been observed to contain mutations that promote AKT phosphorylation, and thus the inactivation of FOXOs, effectively preventing proper cell cycle regulation. FOXO4 activates the cell cycle dependent kinase inhibitor, P27, which in turn prevents tumors from progressing into G1. In HER-2 positive tumor cells, increasing FOXO4 activity reduces tumor size. Chromosomal translocations of FOXO4 have been shown to be a cause of acute leukemia. The fusion proteins formed by these translocations lack the DNA-binding domain, causing the protein to lose function. In gastric cancers (GC), it has been observed that there were lower levels of FOXO4 mRNA in cancers that had already progressed to invading lymph nodes compared to cancers that remained in situ. When compared to normal tissue, all GC epithelia had lower levels of FOXO4 located in the nucleus, consistent with less FOXO4 effector activity and FOXO4’s function as a suppressor of carcinogenic properties. It does this by causing cell cycle arrest between the Go and S phases, preventing cell proliferation, as well as by inhibiting metastasis by downregulating vimentin. These results are consistent with FOXO4 providing a role in inhibiting the epithelia to mesenchymal transition (EMT). In non-small cell lung carcinoma, there are varying levels of FOXO4 expressed that correspond to how the cancer was staged; worse cases had the lowest amount of FOXO4 while less severe cases had higher levels of FOXO4. As with gastric cancer, these cancers with the lowest levels of FOXO4 also had the lowest levels of E-cadherin and highest levels of vimentin, consistent with FOXO4 acting as a suppressor of the EMT phenotype. FOXO4 has been shown to interact with PIN1 and Mdm2. ↑ Parry P, Wei Y, Evans G (Feb 1995). "Cloning and characterization of the t(X;11) breakpoint from a leukemic cell line identify a new member of the forkhead gene family". Genes Chromosomes Cancer. 11 (2): 79–84. doi:10.1002/gcc.2870110203. PMID 7529552. ↑ "Entrez Gene: MLLT7 myeloid/lymphoid or mixed-lineage leukemia (trithorax homolog, Drosophila); translocated to, 7". ↑ Weigel D, Jäckle H (Nov 1990). "The fork head domain: a novel DNA binding motif of eukaryotic transcription factors?". Cell. 63 (3): 455–456. doi:10.1016/0092-8674(90)90439-l. PMID 2225060. ↑ Kaestner KH, Knochel W, Martinez DE (Jan 2000). "Unified nomenclature for the winged helix/forkhead transcription factors". Genes & Development. 14 (2): 142–146. doi:10.1101/gad.14.2.142. PMID 10702024. ↑ van der Horst A, Burgering BM (Jun 2007). "Stressing the role of FoxO proteins in lifespan and disease". Nature Reviews Molecular Cell Biology. 8 (6): 440–450. doi:10.1038/nrm2190. PMID 17522590. ↑ van der Heide LP, Jacobs FM, Burbach JP, Hoekman MF, Smidt MP (Nov 2005). "FoxO6 transcriptional activity is regulated by Thr26 and Ser184, independent of nucleo-cytoplasmic shuttling". The Biochemical Journal. 391 (Pt 3): 623–629. doi:10.1042/BJ20050525. PMID 15987244. ↑ Matsuzaki H, Daitoku H, Hatta M, Aoyama H, Yoshimochi K, Fukamizu A (Aug 2005). "Acetylation of Foxo1 alters its DNA-binding ability and sensitivity to phosphorylation". Proceedings of the National Academy of Sciences of the United States of America. 102 (32): 11278–11283. doi:10.1073/pnas.0502738102. PMC 1183558 . PMID 16076959. ↑ Boura E, Silhan J, Herman P, Vecer J, Sulc M, Teisinger J, Obsilova V, Obsil T (Mar 2007). "Both the N-terminal loop and wing W2 of the forkhead domain of transcription factor Foxo4 are important for DNA binding". The Journal of Biological Chemistry. 282 (11): 8265–8275. doi:10.1074/jbc.M605682200. PMID 17244620. ↑ Tsai KL, Sun YJ, Huang CY, Yang JY, Hung MC, Hsiao CD (2007). "Crystal structure of the human FOXO3a-DBD/DNA complex suggests the effects of post-translational modification". Nucleic Acids Research. 35 (20): 6984–6994. doi:10.1093/nar/gkm703. PMID 17940099. ↑ Brent MM, Anand R, Marmorstein R (Sep 2008). "Structural basis for DNA recognition by FoxO1 and its regulation by posttranslational modification". Structure. 16 (9): 1407–16. doi:10.1016/j.str.2008.06.013. PMID 18786403. ↑ Manning BD, Cantley LC (Jun 2007). "AKT/PKB signaling: navigating downstream". Cell. 129 (7): 261–1274. doi:10.1016/j.cell.2007.06.009. PMC 2756685 . PMID 17604717. ↑ Calnan DR, Brunet A (Apr 2008). "The FoxO code". Oncogene. 27 (16): 2276–2288. doi:10.1038/onc.2008.21. PMID 18391970. ↑ Neumann-Haefelin E, Qi W, Finkbeiner E, Walz G, Baumeister R, Hertweck M (Oct 2008). "SHC-1/p52Shc targets the insulin/IGF-1 and JNK signaling pathways to modulate life span and stress response in C. elegans". Genes & Development. 22 (19): 2721–2735. doi:10.1101/gad.478408. PMC 2559911 . PMID 18832074. ↑ Kenyon C, Chang J, Gensch E, Rudner A, Tabtiang R (Dec 1993). "A C. elegans mutant that lives twice as long as wild type". Nature. 366 (6454): 461–464. doi:10.1038/366461a0. PMID 8247153. ↑ Willcox BJ, Donlon TA, He Q, Chen R, Grove JS, Yano K, Masaki KH, Willcox DC, Rodriguez B, Curb JD (Sep 2008). "FOXO3A genotype is strongly associated with human longevity". Proceedings of the National Academy of Sciences of the United States of America. 105 (37): 13987–13992. doi:10.1073/pnas.0801030105. PMC 2544566 . PMID 18765803. ↑ Li J, Yen C, Liaw D, Podsypanina K, Bose S, Wang SI, Puc J, Miliaresis C, Rodgers L, McCombie R, Bigner SH, Giovanella BC, Ittmann M, Tycko B, Hibshoosh H, Wigler MH, Parsons R (Mar 1997). "PTEN, a putative protein tyrosine phosphatase gene mutated in human brain, breast, and prostate cancer". Science. 275 (5308): 1943–1947. doi:10.1126/science.275.5308.1943. PMID 9072974. ↑ Samuels Y, Wang Z, Bardelli A, Silliman N, Ptak J, Szabo S, Yan H, Gazdar A, Powell SM, Riggins GJ, Willson JK, Markowitz S, Kinzler KW, Vogelstein B, Velculescu VE (Apr 2004). "High frequency of mutations of the PIK3CA gene in human cancers". Science. 304 (5670): 554. doi:10.1126/science.1096502. PMID 15016963. ↑ Saal LH, Holm K, Maurer M, Memeo L, Su T, Wang X, Yu JS, Malmström PO, Mansukhani M, Enoksson J, Hibshoosh H, Borg A, Parsons R (Apr 2005). "PIK3CA mutations correlate with hormone receptors, node metastasis, and ERBB2, and are mutually exclusive with PTEN loss in human breast carcinoma". Cancer Research. 65 (7): 2554– 2559. doi:10.1158/0008-5472-CAN-04-3913. PMID 15805248. 1 2 Yang H, Zhao R, Yang HY, Lee MH (Mar 2005). "Constitutively active FOXO4 inhibits Akt activity, regulates p27 Kip1 stability, and suppresses HER2-mediated tumorigenicity". Oncogene. 24 (11): 1924–35. doi:10.1038/sj.onc.1208352. PMID 15688030. 1 2 Paik JH, Kollipara R, Chu G, Ji H, Xiao Y, Ding Z, Miao L, Tothova Z, Horner JW, Carrasco DR, Jiang S, Gilliland DG, Chin L, Wong WH, Castrillon DH, DePinho RA (Jan 2007). "FoxOs are lineage-restricted redundant tumor suppressors and regulate endothelial cell homeostasis". Cell. 128 (2): 309–323. doi:10.1016/j.cell.2006.12.029. PMID 17254969. ↑ Liu X, Zhang Z, Sun L, Chai N, Tang S, Jin J, Hu H, Nie Y, Wang X, Wu K, Jin H, Fan D (Dec 2011). "MicroRNA-499-5p promotes cellular invasion and tumor metastasis in colorectal cancer by targeting FOXO4 and PDCD4". Carcinogenesis. 32 (12): 1798–1805. doi:10.1093/carcin/bgr213. PMID 21934092. ↑ Su L, Liu X, Chai N, Lv L, Wang R, Li X, Nie Y, Shi Y, Fan D (2014). "The transcription factor FOXO4 is down-regulated and inhibits tumor proliferation and metastasis in gastric cancer". BMC Cancer. 14: 378. doi:10.1186/1471-2407-14-378. PMID 24886657. 1 2 Xu MM, Mao GX, Liu J, Li JC, Huang H, Liu YF, Liu JH (2014). "Low expression of the FoxO4 gene may contribute to the phenomenon of EMT in non-small cell lung cancer". Asian Pacific Journal of Cancer Prevention. 15 (9): 4013–4018. doi:10.7314/apjcp.2014.15.9.4013. PMID 24935588. ↑ Brenkman AB, de Keizer PL, van den Broek NJ, van der Groep P, van Diest PJ, van der Horst A, Smits AM, Burgering BM (Sep 2008). "The peptidyl-isomerase Pin1 regulates p27kip1 expression through inhibition of Forkhead box O tumor suppressors". Cancer Res. 68 (18): 7597–605. doi:10.1158/0008-5472.CAN-08-1059. PMID 18794148. ↑ Brenkman AB, de Keizer PL, van den Broek NJ, Jochemsen AG, Burgering BM (2008). Cookson MR, ed. "Mdm2 induces mono-ubiquitination of FOXO4". PLoS ONE. 3 (7): e2819. doi:10.1371/journal.pone.0002819. PMC 2475507 . PMID 18665269. Borkhardt A, Repp R, Haas OA, Leis T, Harbott J, Kreuder J, Hammermann J, Henn T, Lampert F (1997). "Cloning and characterization of AFX, the gene that fuses to MLL in acute leukemias with a t(X;11)(q13;q23)". Oncogene. 14 (2): 195–202. doi:10.1038/sj.onc.1200814. PMID 9010221. Peters U, Haberhausen G, Kostrzewa M, Nolte D, Müller U (1997). "AFX1 and p54nrb: fine mapping, genomic structure, and exclusion as candidate genes of X-linked dystonia parkinsonism". Hum. Genet. 100 (5-6): 569–72. doi:10.1007/s004390050553. PMID 9341872. Kops GJ, de Ruiter ND, De Vries-Smits AM, Powell DR, Bos JL, Burgering BM (1999). "Direct control of the Forkhead transcription factor AFX by protein kinase B". Nature. 398 (6728): 630–4. doi:10.1038/19328. PMID 10217147. Takaishi H, Konishi H, Matsuzaki H, Ono Y, Shirai Y, Saito N, Kitamura T, Ogawa W, Kasuga M, Kikkawa U, Nishizuka Y (1999). "Regulation of nuclear translocation of forkhead transcription factor AFX by protein kinase B". Proc. Natl. Acad. Sci. U.S.A. 96 (21): 11836–41. doi:10.1073/pnas.96.21.11836. PMC 18373 . PMID 10518537. Furuyama T, Nakazawa T, Nakano I, Mori N (2000). "Identification of the differential distribution patterns of mRNAs and consensus binding sequences for mouse DAF-16 homologues". Biochem. J. 349 (Pt 2): 629–34. doi:10.1042/0264-6021:3490629. PMC 1221187 . PMID 10880363. Weigelt J, Climent I, Dahlman-Wright K, Wikström M (2000). "1H, 13C and 15N resonance assignments of the DNA binding domain of the human forkhead transcription factor AFX". J. Biomol. NMR. 17 (2): 181–2. doi:10.1023/A:1008358816478. PMID 10921784. Brownawell AM, Kops GJ, Macara IG, Burgering BM (2001). "Inhibition of nuclear import by protein kinase B (Akt) regulates the subcellular distribution and activity of the forkhead transcription factor AFX". Mol. Cell. Biol. 21 (10): 3534–46. doi:10.1128/MCB.21.10.3534-3546.2001. PMC 100275 . PMID 11313479. Weigelt J, Climent I, Dahlman-Wright K, Wikström M (2001). "Solution structure of the DNA binding domain of the human forkhead transcription factor AFX (FOXO4)". Biochemistry. 40 (20): 5861–9. doi:10.1021/bi001663w. PMID 11352721. De Ruiter ND, Burgering BM, Bos JL (2001). "Regulation of the Forkhead transcription factor AFX by Ral-dependent phosphorylation of threonines 447 and 451". Mol. Cell. Biol. 21 (23): 8225–35. doi:10.1128/MCB.21.23.8225-8235.2001. PMC 99987 . PMID 11689711. Tang TT, Dowbenko D, Jackson A, Toney L, Lewin DA, Dent AL, Lasky LA (2002). "The forkhead transcription factor AFX activates apoptosis by induction of the BCL-6 transcriptional repressor". J. Biol. Chem. 277 (16): 14255–65. doi:10.1074/jbc.M110901200. PMID 11777915. Yang Z, Whelan J, Babb R, Bowen BR (2002). "An mRNA splice variant of the AFX gene with altered transcriptional activity". J. Biol. Chem. 277 (10): 8068–75. doi:10.1074/jbc.M106091200. PMID 11779849. Kops GJ, Medema RH, Glassford J, Essers MA, Dijkers PF, Coffer PJ, Lam EW, Burgering BM (2002). "Control of cell cycle exit and entry by protein kinase B-regulated forkhead transcription factors". Mol. Cell. Biol. 22 (7): 2025–36. doi:10.1128/MCB.22.7.2025-2036.2002. PMC 133681 . PMID 11884591. So CW, Cleary ML (2002). "MLL-AFX requires the transcriptional effector domains of AFX to transform myeloid progenitors and transdominantly interfere with forkhead protein function". Mol. Cell. Biol. 22 (18): 6542–52. doi:10.1128/MCB.22.18.6542-6552.2002. PMC 135648 . PMID 12192052. Tang TT, Lasky LA (2003). "The forkhead transcription factor FOXO4 induces the down-regulation of hypoxia-inducible factor 1 alpha by a von Hippel-Lindau protein-independent mechanism". J. Biol. Chem. 278 (32): 30125–35. doi:10.1074/jbc.M302042200. PMID 12761217. Crossley LJ (2003). "Neutrophil activation by fMLP regulates FOXO (forkhead) transcription factors by multiple pathways, one of which includes the binding of FOXO to the survival factor Mcl-1". J. Leukoc. Biol. 74 (4): 583–92. doi:10.1189/jlb.0103020. PMID 12960271.